Chişinău (IPA: [ki.ʃi. 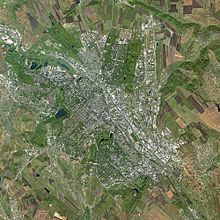 'nəw]) (also known as Kishinev, Russian: Кишинёв, Kishinyov) is the capital city, the industrial and commercial center, and the largest city of Moldova. Inhabited for thousands of years, the city has been under Ottoman and Russian control, has endured a pogrom, has been devastated by an earthquake, occupied by the Red Army, bombed by the Nazi luftwaffe, visited by the Holocaust in which 10,000 Jewish people were killed, and has been part of the Soviet empire. Moldova is one of the poorest nations in Europe, and was the first former Soviet state to elect a Communist as its president in 2001. Since the country gained its independence in 1991, Chişinău has continued to face significant challenges. While its situation is intrinsically tied with Moldova's and it is highly dependent upon the path the nation takes, it has attempted to rebuild itself in spite of overwhelming odds. This is most evident in its numerous parks and gardens which lend to the city's reputation for being among other European cities with the highest proportion of green spaces. Chişinău seen from Spot Satellite. The name Chişinău could come from the old Romanian word chişla ("spring" or "source of water") and nouă ("new"), because it was built around a small spring, which exists today at the corner of Pushkin and Albişoara Streets. 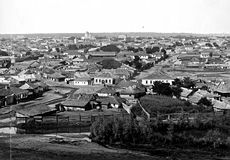 The English language name for the city was based on the modified Russian "Kishinev," since it entered the English language at the time Chişinău was part of the Russian Empire. The city is located on the river Bîc, a tributary of the Dniester, in the middle of the central area of Moldova. The city is surrounded by a relatively level landscape with fertile ground, used for cultivating grapevines and fruit since medieval times. Chişinău experienced near destruction during World War II; a result of both bombing and an earthquake. Old sections of the town are subject to flooding, but the rebuilt areas are built on terraces along the Bîc. The city is known for its extensive parks and green areas. The lowest point in Moldova is the Dniester River at 6.5 feet (two meters). The city has an area of 46.3 square miles (120 square kilometers), while the entire municipality covers 245 square miles (635 square kilometers). Chişinău has a continental climate, characterized by hot dry summers and cold windy winters. The average maximum daytime temperature in January (winter) is 40°F (4°C), although temperatures often dip below 0°C (32°F). The average summer maximum of around 81°F (27°C) in July. Mean annual precipitation is 63 inches (1600 mm), higher in spring and autumn, with infrequent yet heavy storms in summer. Many streets of Chişinău are named after historic persons, places or events. Independence from the Soviet Union was followed by a large-scale renaming of streets and localities from a Communist theme into a national one. Moldova, known in the past as Bessarabia and Moldavia, has been inhabited for thousands of years, originally by Cimmerians, then Scythians, Ancient Greeks, Dacians, Romans, Goths, Huns, Avars, Bulgars, and Tatars. Founded in 1436 as a monastery town, Chişinău was part of the Moldavian Principality. It fell under the suzerainty of the Ottoman Empire in the sixteenth century. At the beginning of the nineteenth century it was a small town of 7,000 inhabitants. In 1812, it was came under Russian imperial administration, which made it the capital of the newly annexed gubernia of Bessarabia. Its population had grown to 92,000 by 1862, and to 125,787 by 1900. 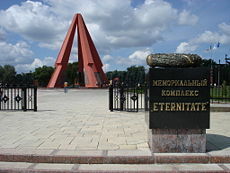 Eternitate memorial complex, dedicated to the soldiers of the Red Army who fell during the Jassy-Kishinev Operation of World War II. From 1834, an imperial townscape, with broad and long roads, emerged as a result of a generous town development plan, which divided the city roughly into two areas: the old part of the town, with its irregular building structures, and a newer city center and station. The town played an important part in the Russo-Turkish War (1877-1878), as the chief center of the Russian invasion. Growing anti-semitic sentiment in Russia in the late nineteenth century meant that many Jews settled in Chişinău. By 1900, 43 percent of the population of Chişinău was Jewish—one of the highest numbers in Europe. However, in April 1903 anti-Jewish articles in the the only official newspaper sparked three days of anti-Semitic rioting, in which about 49 Jews were killed, 92 severely wounded, and 500 suffered minor injuries. Hundreds of houses and many businesses were plundered and destroyed. The killings prompted U.S. President Theodore Roosevelt to petition Tsar Nicholas II of Russia on behalf of the American people in July 1905. On August 22, 1905, police opened fire on an estimated 3,000 demonstrating agricultural workers. In October of that year, a further protest turned into an attack on Jews, resulting in 19 deaths. After the Russian October Revolution in 1917, Bessarabia was declared an autonomous constituent republic of the Federation of Russian Republics. The Russian Bolshevik revolutionary army occupied Chişinău in January 1918. Romanian forces drove the Bolsheviks out within two weeks, and on February 6, Bessarabia was declared an independent Moldavian republic, cutting ties with Russia. Bessarabia united with the Kingdom of Romania the same year. Chişinău was regarded as no more than a large provincial city. Although Romanian Bessarabia languished economically, Chişinău was quickly industrialized, prompting growth. Between 1918 and 1940, the center of the city was renovated. In 1927, a monument to Prince Stephen III of Moldavia was erected. During the Second World War (1939-1945) Chişinău was nearly destroyed. The Soviet Red Army occupied Chişinău on June 28, 1940. As the city began to recover, a devastating 7.3 (on the Richter scale) earthquake struck on November 10 that year. The German and Romanian armies began an assault on the newly created Moldovan SSR in July 1941—Nazi air raids bombed the city heavily. The Red Army resistance held until Chişinău finally fell on July 17, 1941. German occupation brought the Holocaust to Chişinău. Jewish inhabitants were transported on trucks to the outskirts of the city and then shot in partially dug pits. Approximately 10,000 Jews were murdered during the occupation. As German troops retreated, the city was involved in heavy fighting. The Red Army retook Chişinău on August 24, 1944, by which time the city had lost about 70 percent of its buildings. After the war, most of Bessarabia became the Moldavian SSR with Chişinău as its capital; smaller parts of Bessarabia became parts of the Ukrainian SSR. Architect Alexey Shchusev developed a plan for reconstruction of the city. The population began to grow rapidly in the 1950s. The Soviet administration built large-scale housing and palaces in the style of Stalinist architecture. This process continued under Nikita Khrushchev, under the slogan "good, cheaper, and built faster." During Leonid I. Brezhnev's tenure as the effective ruler of the USSR from 1964 to 1982, the Soviet Union invested one billion rubles for further redevelopment of the city. Under Mikhail Gorbachev's administration of the Soviet Union, from 1985 until its collapse in 1991, the Moldovan Popular Front formed in 1989, to win a majority in the first democratic elections to the Moldavian SSR's Supreme Soviet, in February 1990. 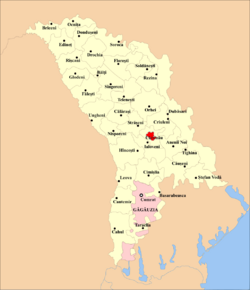 Transnistria, the part of Moldova east of the Dniester River, declared independence from Moldova to stay within the Soviet Union, on September 2, 1990. In May 1991, the country's official name was changed to the Republic of Moldova, and on August 27 of that year, after the collapse of a coup against Gorbachev, Moldova declared its independence from the Soviet Union. In March 1992, a brief war between Moldovan and Transnistrian separatist forces took place. On July 28, 1992, Parliament ratified a new constitution, which went into effect August 27, 1994, and provided substantial autonomy to Transnistria and to Gagauzia. In the 2001 elections, the Communist Party of Moldova won the majority of seats in the parliament and appointed Vladimir Voronin as president. Relationships between Moldova and Russia deteriorated in November 2003, over the Transnistrian conflict. In the following election, held in 2005, the Communist party made a 180-degree turn and was re-elected on a pro-Western platform, with Voronin being re-elected to a second term as a president. Moldova is a republic in which the president, who is elected by parliament for a four-year term, is the chief of state, and the prime minister, who is designated by the president upon consultation with parliament, is head of government. The unicameral parliament has 101 members elected by popular vote to serve four-year terms. Moldova is a one party dominant state with the Party of Communists of the Republic of Moldova in power in 2008. Moldova is administratively subdivided in 32 districts, two autonomous units, and three municipalities. Chişinău is one of the municipalities. Besides the city itself, the municipality comprises 34 other suburban localities, and is subdivided into five sectors, each comprising a part of the city itself and several suburbs. The municipality elects a mayor and a local council, which then name five pretors, one for each sector. 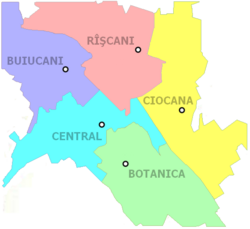 The five sectors of Chişinău are: Botanica, Buiucani, Centru, Ciocana, and Râşcani. Chişinău is governed by the city council and the city mayor (Romanian: Primar), both elected once every four years. The first mayor of Chişinău was Angel Nour in 1817. In 1941 the office was abolished. After the Soviet era and the re-establishment of the office in 1990 Nicolae Costin became the first democratically elected mayor. Moldova remains one of the poorest countries in Europe. With a favorable climate and good farmland, but without major mineral deposits, the economy depends heavily on agriculture, featuring fruits, vegetables, wine, and tobacco. Moldova's dependence on Russian energy was underscored at the end of 2005, when a Russian-owned electrical station in Moldova's separatist Transnistria region cut off power to Moldova and Russia's Gazprom cut off natural gas to Moldova in disputes over pricing. Economic reforms have been slow because of corruption and strong political forces backing government controls. The economy remains vulnerable to higher fuel prices, poor weather, and the skepticism of foreign investors. Also, the presence of an illegal separatist regime in Moldova's Transnistria region continues to be a drag on the Moldovan economy. Chişinău is the most economically-developed and industrialized city in Moldova. The city's economy focuses on industry and services, with services growing in importance in the 10 years to 2008. Its main industries include consumer and electrical goods, building materials, machinery, plastics, rubber, and textiles. The main service fields are banking and shopping/commerce. Most of Moldova's media industry is based in Chişinău. Moldova's per capita gross domestic product was US$2900 in 2007. The most popular form of internal transport in Moldova is generally by bus, which can be inexpensive. From 1994, new trolleybus lines were built, and the capacity of existing lines increased. Within Chişinău, privately-operated minibuses, known as "maxi-taxis," follow the major bus routes. Taxis are widely used. 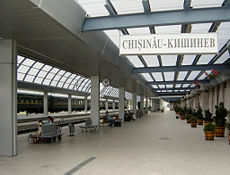 An international railway terminal has connections to Bucharest, Kiev, Minsk, Odessa, and Moscow, although conflict with the unrecognized Transnistria republic disrupts rail traffic towards Ukraine. The Chişinău International Airport offers connections to a number of European cities, and handled 689,000 passengers in 2007. The urban population was 785,000 in 2007, while the metropolitan population was 911,400. Traditionally a rural country, Moldova gradually began changing its character under Soviet rule. As urban areas became the sites of new industrial jobs and of amenities such as clinics, the population of cities and towns grew. The new residents were not only ethnic Moldovans who had moved from rural areas but also many ethnic Russians and Ukrainians who had been recruited to fill positions in industry and government. Controversy concerns the identity between Moldovans and Romanians, as well as between the corresponding Moldovan and Romanian languages. The 2004 Moldovan census describes ethnic groups in Moldova as follows: Moldovan/Romanian 78.2 percent, Ukrainian 8.4 percent, Russian 5.8 percent, Gagauz 4.4 percent, Bulgarian 1.9 percent, other 1.3 percent. The state language is Moldovan. In some cases Russian is used alongside Moldovan (Romanian) within state institutions, despite not having legal status. The 2004 census shows that Eastern Orthodox make up 98.5 percent of the faithful, and Judaism 1.5 percent. A total 2.29 percent of the population did not declare a religion. Chişinău is home to 12 public and 11 private universities, to the Academy of Sciences of Moldova, as well as to a number of institutions offering both high-school education, as well as 1-2 years of college education. 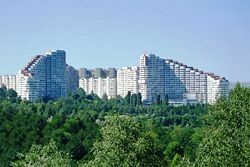 Since the collapse of the Soviet Union, the city has become a relatively lively and well-provisioned capital, with a much higher standard of living than most rural areas. Chişinău has numerous buildings designed and built in the nineteenth century. 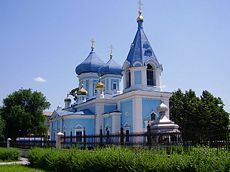 Between May 26, 1830, and October 13, 1836, the architect Avraam Melnikov established the Catedrala Naşterea Domnului (an Orthodox Cathedral) with a magnificent bell tower. In 1840, the building of the Triumphal Arch, planned by the architect Luca Zauşkevici, was completed. Following this the construction of numerous additional buildings and landmarks began. The Orthodox Cathedral's belfry was demolished during the Soviet era, to be rebuilt after independence. Chişinău is home to Moldova's largest recording labels. The city's music scene is quite eclectic. Many Moldovan rock bands of the 1970s and 1980s continue to be popular, while since the 1990s, there has been growth in the boy band and hip hop genres. There are four professional football clubs in Chişinău, all playing in the Divizia Naţională (national league): FC Zimbru Chişinău, FC Dacia Chişinău, FC Politehnica Chişinău and CSCA-Steaua Chişinău, ranked respectively 4th, 5th, 7th, and 8th in the 2004/5 season. Of the larger football stadiums in the city, the Republican Stadium has 7687 seats, and the Dinamo Stadium has a capacity of 2692. The Zimbru stadium, opened in May 2006, can seat 10,500. Chişinău is the capital, industrial and commercial center, and the largest city, of Moldova, one of the poorest countries in Europe. Since independence in 1991, the city has continued to face significant challenges since it lacks significant mineral wealth, is dependent upon Russian energy, is hindered by corruption, and has to deal with the presence of an illegal separatist regime in Transnistria. Improvements in government fiscal arrangements and the legal framework are needed to move the country out of poverty. In order for the city and the nation to prosper, international intervention will likely be necessary, at least in the form of financial aid and political and social guidance and oversight. As the largest city and economic and administrative capital of the nation, Chişinău 's situation is intricately tied to that of Moldova. The city's situation is highly dependent upon the path the nation takes. ↑ Kishinev.info, Istoria (Romanian). Retrieved September 18, 2008. ↑ Virtual Kishinev, Kishinev Pogroms. Retrieved September 18, 2008. ↑ American-Israeli Cooperative Enterprise, Memories of the Holocaust: Kishinev (Chisinau) (1941-1944). Retrieved September 18, 2008. Aroni, Samuel. 1995. Memories of the Holocaust: Kishinev (Chisinau): 1941-1944. LosAngeles: Univ. of California, Internat. Studies and Overseas Programs ISOP. OCLC 164921627. Hamm, Michael F. 1998.Kishinev: The Character and Development of a Tsarist Frontier Town. Nationalities Papers. Volume 26. Issue 1. Judge, Edward H. 1992. Easter in Kishinev: Anatomy of a Pogrom. Reappraisals in Jewish Social and Intellectual History. New York: New York University Press. ISBN 9780814741931. Penkower, Monty Noam. 2004. The Kishinev Pogrom of 1903: A Turning Point in Jewish History. Modern Judaism 24 (3): 187-225. OCLC 88393094. Jewish community of Chişinău (English). This page was last modified on 15 February 2017, at 15:37.